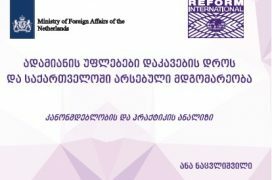 This factsheet “Human Rights during Police Detention and the Situation in Georgia” includes analysis of legislation and practices as regards police detention in Georgia, including safeguards and violations and relevant statistics. The document discusses all the challenges and human rights violations bringing concrete cases as evidence during administrative detention as well as during detention under criminal law. The document highlights legislative drawbacks, human rights violations and ill-treatment encountered during detention, safeguards for avoiding torture and ill-treatment, ineffective practice regarding torture detection and necessity of independent investigation mechanism. Recommendations for improvements on legislative and policy levels are outlined. The factsheet has been produced by Ana Natsvlishvili, invited consultant, within the scope of the project ‘Reducing torture and ill-treatment through strengthening preventive monitoring mechanisms in Armenia and Georgia’, implemented by Penal Reform International South Caucasus Office and funded by the Netherlands Ministry of Foreign Affairs.